The perfect side dish for Mexican night, this recipe for cilantro lime rice is a restaurant copy-cat that also works well in burritos. I am obsessed with Mexican foods, as I’m sure you are too? I feel like Mexican food, tacos, burritos and enchiladas, are kind of having a moment right now. Mind you, I still don’t really get the soggy-enchilada thing, but maybe one of these days I will be enlightened. Even though I’m not really on the enchilada bandwagon, I am in the boat of turning everything possible into a taco or burrito. I mean have you seen the sushi burritos on Instagram? Sign me up. I’ve shared a couple of recipes for Rice and Beans or Mexican Rice but this is a recipe inspired by everyone’s favourite, Chipotle. I love the Cilantro Lime Rice they put in their burritos and wanted to make my own at home, because let’s face it. Chipotle is on the expensive side of the fast food world, and I’m on a student budget. My most recent go-to meal has been burrito bowls, using my favourite Slow Cooker Shredded Chicken Tacos. Making the chicken in the slow cooker means that I can put on the slow cooker in the morning and come home to a delicious meal of Chicken Burrito Bowls when I get home. My favourite toppings? Salsa, avocado, sour cream, grated cheddar cheese and black beans! I’ll be sharing a yummy burrito bowl recipe in the coming weeks so stay tuned. If you’re looking for a way to change up your side dishes with just a tiny bit of extra effort, this Cilantro Lime Rice will do just that! It’s great served with chicken or pork, even if it’s not Mexican inspired. Cilantro Lime Rice is a go-to for Mexican night! Cook rice according to package directions, about 20 minutes. In a small food processor pulse together cilantro, olive oil, lime juice, garlic, cumin and salt. Stir cilantro mixture into cooked rice and serve. 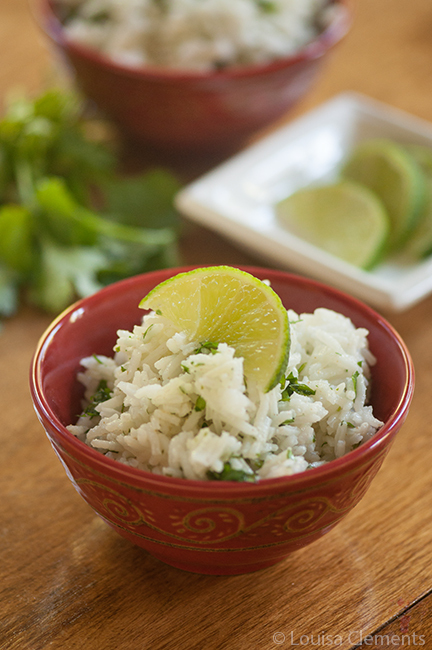 Let me know if you give this Cilantro Lime Rice a try – it’s my go-to for Mexican night! Oh my goodness I would save so much money if I could make Chipotle style bowls at home!! I love the rice so I can't wait to try this! That's exactly why I made this, Liz! I spend too much money at Chipotle - haha! Let me know if you give it a try.